Today, because I wanted to eat something delicious (and healthy!) for lunch, I made a big bowl of Tabbouleh. Do you know this vegan Lebanese dish? It’s crunchy with cracked wheat, and fragrant with fresh parsley and mint. Even meat-eaters love it. Tabbouleh’s only requirements are Bulgar wheat, olive oil, lemon juice, fresh mint and parsley, plus a diced veggie or two. Feel free to add diced cucumber, diced green beans, or diced just-about-anything your garden or farmers market can provide. 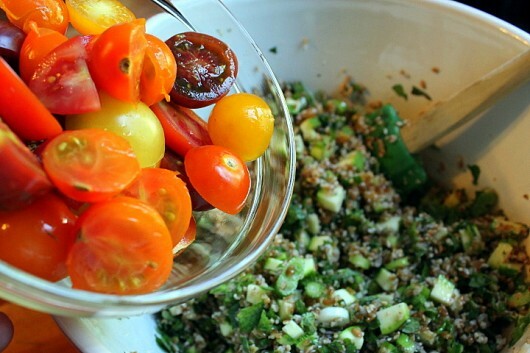 For today’s tabbouleh adventure, I used zucchini, scallions, and heirloom cherry tomatoes. ‘Twas awesome. A note about Bulgar wheat. If your supermarket doesn’t sell this cracked grain, seek it out at health food stores and Middle Eastern markets. Or, just hop a flight to Lebanon. 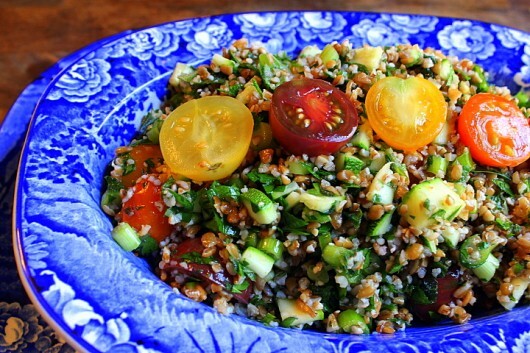 Tabbouleh — and Bulgar wheat — are staples there. 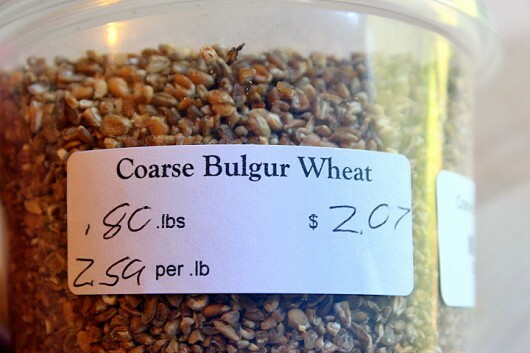 I found coarse Bulgar wheat at my favorite farm store. So no jet-lag for me. 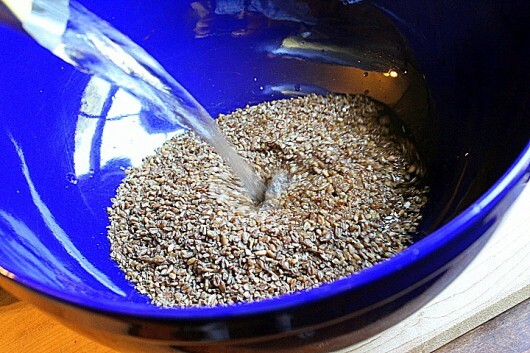 To start, tip the wheat into a big blue bowl. And a big pinch of salt. 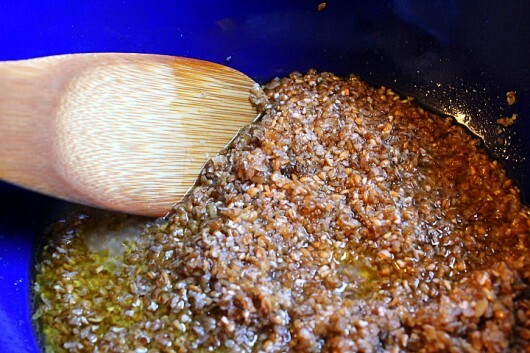 Stir briefly with a wooden spoon, and set aside at room temperature for an hour. 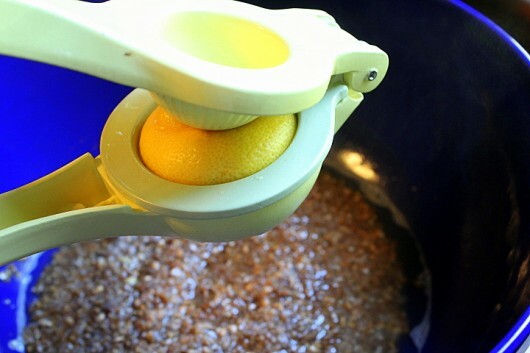 During this time, the wheat will soften up as it absorbs all the yummy liquids in the bowl. And dice (or thinly slice) them. 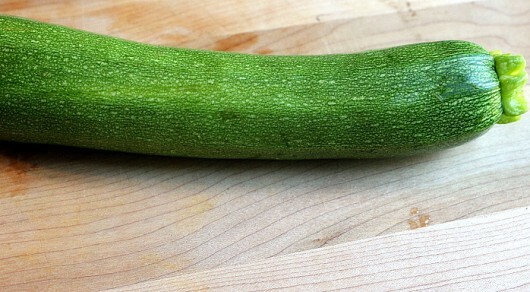 Then nab a young zucchini. By “young,” I mean the squash should not be more than 8 inches in length. Old, gonzo-size zukes are flavorless. 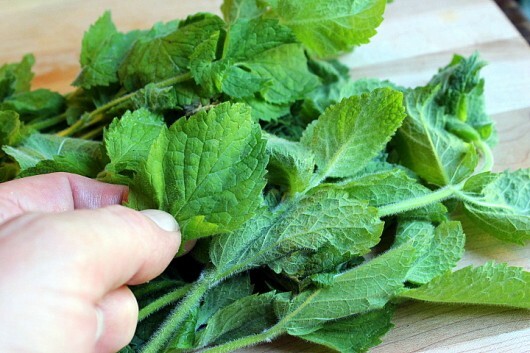 Now run out to the garden, and grab some big bunches of mint and parsley. Then obtain some cherry tomatoes. 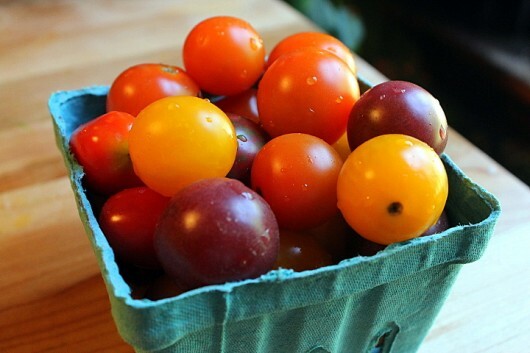 A colorful collection of heirloom varieties will look (and taste) infinitely better than plain ole red subjects. But you can use whatever is available to you. Cut the tomatoes in half through the stem end. A serrated knife is your friend here. Do you remember the bulgar wheat that I placed in a blue bowl? I decided that it would photograph better in a white bowl. Gently fold in the sliced tomatoes. And here comes the hard part. Cover the bowl with plastic wrap, and pop it in the fridge for at least 1 hour. This way, the flavors will have a chance to become acquainted with each other. And before you serve the salad, be sure to taste it carefully. Does it need more salt? Pepper? Lemon juice? Stir these in as your taste buds dictate. And brace yourself for a colorful, crunchy, garden-fresh feast! A vegan Lebanese salad that even meat-eaters will enjoy! Tip the Bulgar wheat into a large bowl. 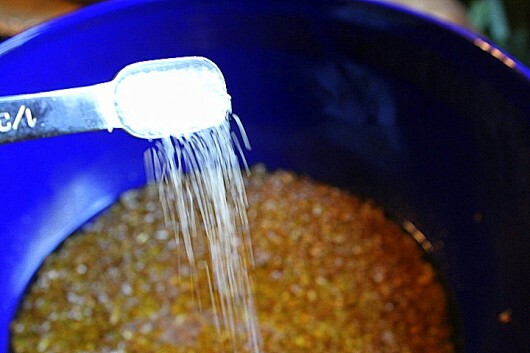 Stir in the boiling water, lemon juice, olive oil, and 1/2 teaspoon salt. Let sit at room temperature for 1 hour. 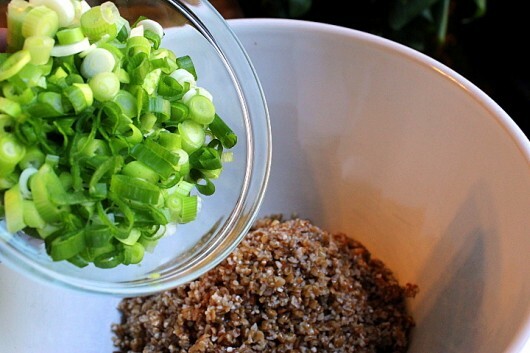 Add the scallions, zucchini, mint, parsley, 1/2 teaspoon salt and grinds of black pepper to the wheat mixture. Stir well. Then, using a spatula, gently fold in the halved cherry tomatoes. Cover the salad, pop it in the refrigerator, and let it chill for at least 1 hour. Taste to correct seasonings. Serve cold, along with goblets of Cabernet Sauvignon or Pinot Noir, and wedges of pita bread. Enjoy this recipe? Sign up for my email updates! What a perfectly refreshing lunch on a warm, sticky summer day!! Such a wonderful blend of tastes and textures!! No one ingredient stands too boldly- all compliment all!! Fragrant mint, sweet tomatoes, savory green onion…the crunch of fresh little zucchini…so simple! So satisfying, so delicious!!! Thanks so much for sharing Kevin!! Hi Brenda – Thanks so much for taste-testing this dish! Glad you liked it! Ohhhhh… thanks for the reminder! Love the stuff and I have a garden full of parsley, tomatoes, and cucs. This looks fabulous! I already have everything I need except the bulgar wheat. Shouldn’t be hard to find at Whole Foods. Thanks, Kevin! 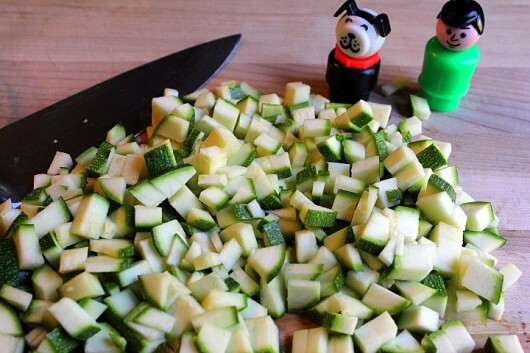 I always make this with cucumber, but I like the idea of using zucchini instead. I’m on it! Just saw your post on FB, and all I can say is YUM. Love your “kitchen helpers” too. Was Lily the Beagle napping while you made this? My aunt Sissy made the best Tabouli in the world. She learned how when living in Beirut and the Saudi desert (her husband worked for the TransArabian Pipeline Co). She also used cucumber instead of zucchini. No kidding: The Best Ever. But yours looks good, too, Kevin! Those multicolored tomatoes are especially enticing. 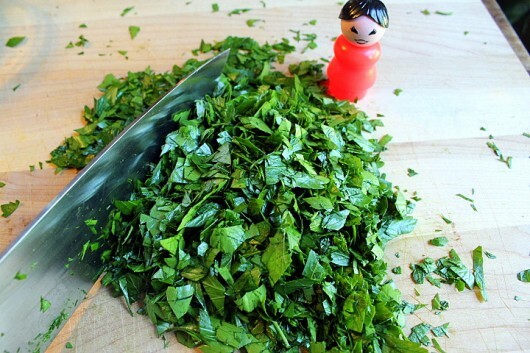 Today I am using my own herbs to make a mint/basil swordfish sauce. 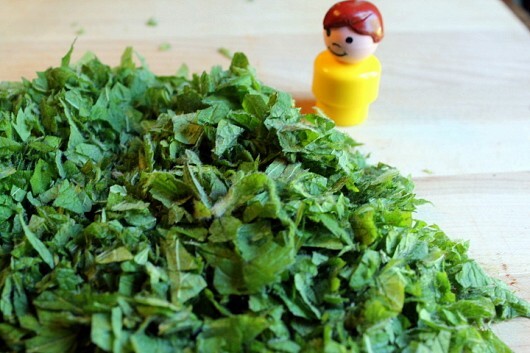 What a luxury to be able to walk a few paces and cut fresh ORGANIC herbs for kitchen adventures. Once you’ve grown a couple herbs, it snowballs into many more as confidence builds for spicing things up. 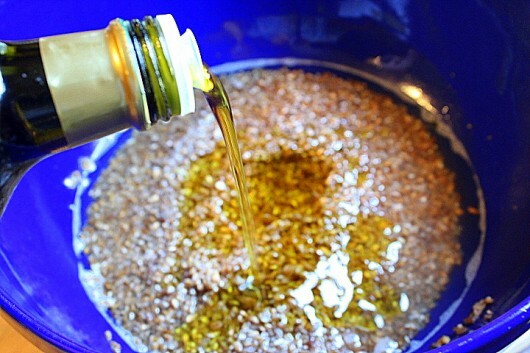 You can make it gluten-free by using quinoa instead of the bulgur. I like garlic with the lemon juice, olive oil and sea salt for the dressing. YUM! 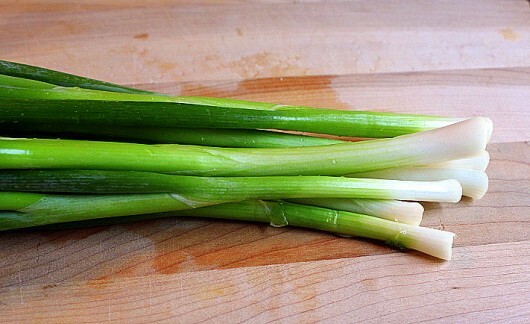 I have everything on hand but the scallions, and I may sub some chives mixed with dehydrated onions, but this is going to happen tomorrow. Then I can have a quick one bowl meal for days during breaks in the backbreaking, joint killing digging of the 110 years of compaction in the parking strip/hell strip. 7×160 feet of it. Color me determined.Color me loony. Feed me tabbouleh. This looks so good. Im going to have to try it with bbq on labor day weekend. 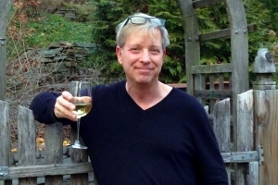 You are the best food, garden, lifestyle writer any reader could hope for! Thanks for week after week of good stuff and lots of laughs. Yum! 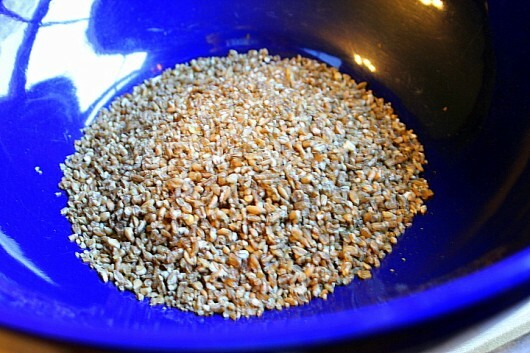 I use my wheat grinder to make my own bulgar. First, I make cracked wheat, then parboil the cracked wheat, drain and cool. Freeze the par boiled cracked wheat in zip loc bags or freezer containers ready to use whenever you want. I’m glad you posted this recipe. It’s perfect for using the summer produce. If I was told I could only have one dish for the rest of my life it would be tabbouleh. I have a recipe from a Jordanian friend, a multivitamin in a bowl!! Thank you for sharing a more cook sparing version. Love the Fisher Price Person and Dog. I have not seen those for years!! Thanks for the chuckle. Sounds like a delicious recipe. Hope to make it today. This looks fabulous. Something sat on my parsley, but I have plenty of mint if I hold off making cookies. Thanks Kevin again. Went to the big city with friends. Bought a bag of Popcorn in a Pickle. It was good popcorn with dill oil. Wild taste!! 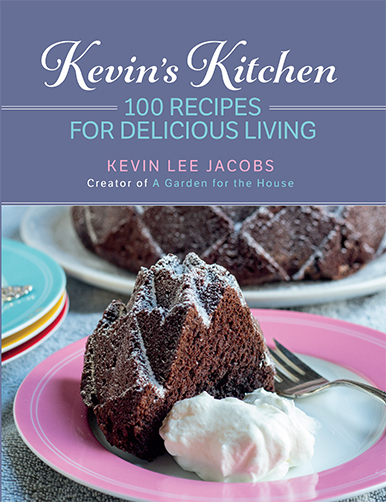 Kevin, Wish I would have thought of tabbouleh yesterday. We made a Lebanese chicken dish with rice I also made a traditional Lebanese cookie. Tabbouleh would have really been a treat .The trick to tabbouleh is to dice white onions and rub salt and allspice into them then add other ingredients. We’ve got a Lebanese theme going on at our farm Lebanese husband middle eastern karakul sheep enough to drive you to drink arak! 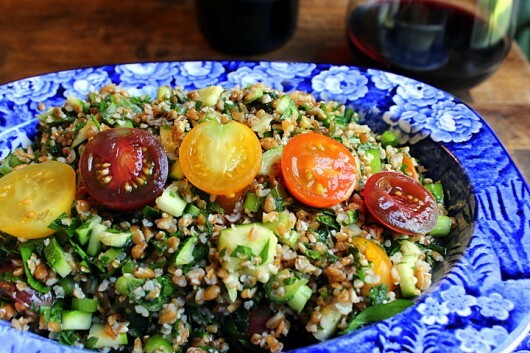 After looking at these mouth watering pictures its definitely time for Tabbouleh here. Love that blue bowl but you’re right, the white one really shows it off. 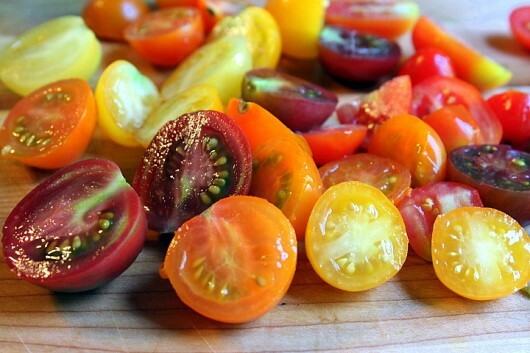 If you know the variety name of that very dark heirloom tomato would you please share? I’m thinking it could be the “chocolate tomato”. Zucchini in place of cucumber is one I’m going to try.. Being sensitive to wheat I use Quinoa as a substitute. It works out well. going to make this——winner!!! !–Little people look happy just like Lily!! 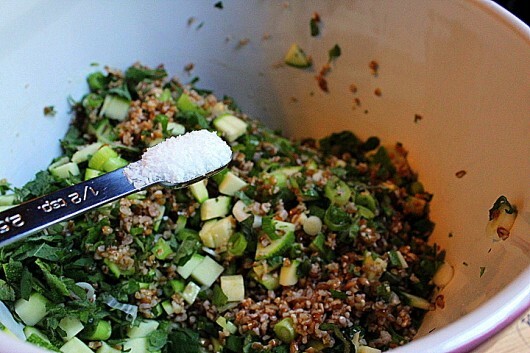 We have made Tabbouleh for years but our recipe came from a family with 12 children so it had to be spread out. We add a couple of chopped heads of lettuce to wheat, mint , scallions, and tomatoes then make a dressing of crushed garlic, olive oil and lemon juice. 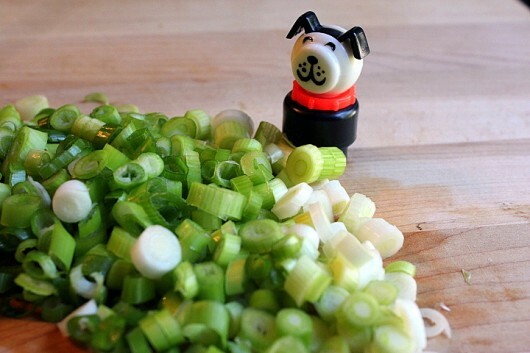 Salt and Pepper, stir well. Make early so seasoning can mix and lettuce wilts…delicious the next day if any is left over, which isn’t very often . yes those tomatoes look scrumpcious!!!! I’m not sure we have Bulger in our little rural area but I will definitely look for it, if not I’ll just bet I can find it online somewhere. 🙂 And could I use basil instead of mint and parsley? don’t have them and am not fond of parsley anyway. Thanks Kevin, you always brighten up my weekend!! And I so envy you that Spa weekend. I so need a soak and massage! 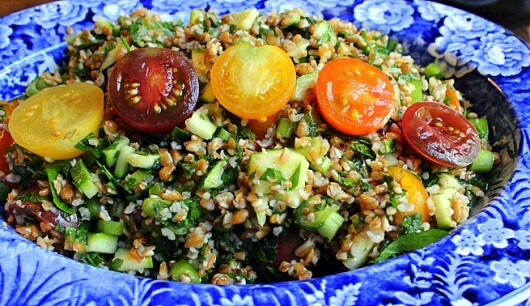 Tabbouleh is a staple in our house, but I don’t include zucchini – just tomato and scallions. We serve with hummus or babaganoush plus falafel. For a pleasant change try tabbouleh mixed with either tuna or ricotta cheese and stuffed into mini pita breads. Sooo delicious and a very portable lunch. Kevin. Love your healthy eating habits. 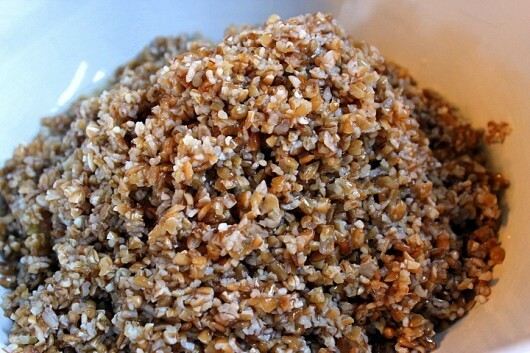 I use as many ‘foreign’ grains as I can…so good. Heard a NPR segment from Chef Pierre from Africa who introduced us to fonio. Do you know of this? I am trying to find an inexpensive way to obtain this! I hear it is healthy and good for you. Also, I am always surprised when watching TV food preparations as they add “a pinch of salt…..”. It is usually much more than I would use as a pinch. In your pictures of this food prep, I see your salt was from 1/2 teaspoon measure. guess I am confused! I only use a minimum of salt, but then I am OLD and am watching my salt intake!!!!!! Love your site, love your humor, love your wit, and love your ideas. Thank you! 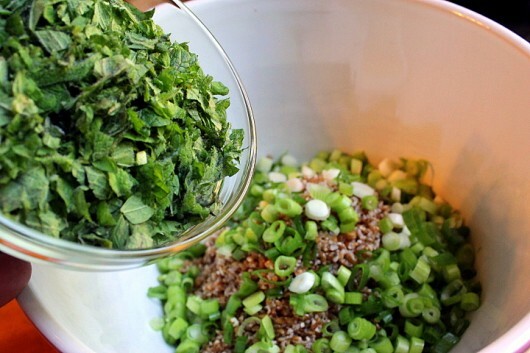 tabbouleh is a go-to dish for me to bring to pot-lucks! zucchini would be good, i might have to try that next year when i am overwhelmed by the garden. My daughter is coming home tonight after being away volunteering in Central America for the past 7 months. 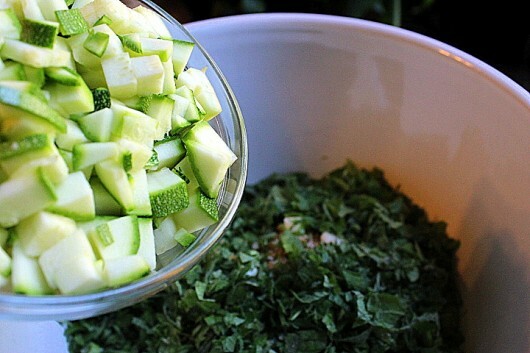 This tabbouleh will be waiting for her. Thank you for the recipe. This recipe looks fabulous, and I can’t wait to try it. Happy to see something low fat and still very tasty. I might also add a little feta to it. I tried this with quinoa because I didn’t have the Bulgar wheat. Delicious! Then I tried it with Bulgar wheat. I think it was better with the quinoa! It makes a great lunch for the whole week. Tonight I’m going to roast root vegetables and continue this new healthy lunch. Bulgar is hard for me to come by. I saw a recipe using quinoa which is really delicious. I have tried using brown rice which works OK and is always on hand but doesn’t absorb the flavors as well since the rice kernels are larger than the bulgar or quinoa. Quinoa is my favorite.